Equitrekking’s Emmy nominated host Darley Newman rides with Hawaiian cowboys at Parker Ranch and Kahua Ranch in Waimea, explores Waipi’o Valley, the Valley of the Kings, attends a luau, observes sea turtles outrigger canoeing and visits Hawaii Volcanoes National Park. With a cattle ranching history predating mainland American ranches by a generation, the people of Hawaii have strong ties to horses. 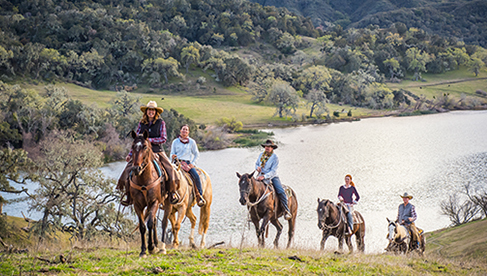 Equitrekking explores this tradition, beginning at Parker Ranch, one of the oldest and largest ranches in the United States. To experience life as a Hawaiian paniolo (cowboy), Darley rides through green pastures with majestic Mauna Kea as a backdrop and learns about cowboy culture in Waimea. Next Darley rides at Kahua Ranch, a working cattle ranch in Waimea. Darley takes in stunning views of the ocean and Kohala coastline as she gallops up the lush, green hills. Out of the saddle, Darley hits a black sand beach, goes outrigger canoeing surrounded by sea turtles, explores Hawaii Volcanoes National Park and attends a luau. Finally, Equitrekking ventures to one of the most remote and sacred parts of the Big Island, Waipi’o Valley, the Valley of the Kings. This valley is home to a herd of wild horses, the only wild herd in the state. Riding these wild Hawaiian Horses, Darley learns about this unique breed, while munching on avocado, papaya, and star fruit grown in abundance in the valley. Only a small number of people live in Waipi'o, surrounded by 1000-foot cliffs lined with waterfalls. Darley learns about life “off the grid,” as she explores the rivers and natural wonders of this special place. Watch the Equitrekking season two preview and purchase Equitrekking DVDs in our Store. 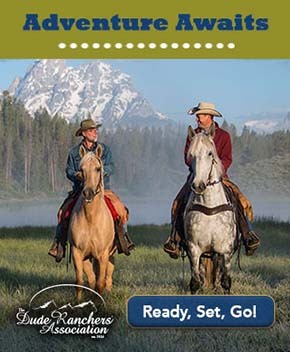 Book an equestrian vacation at EquitrekkingTravel.com.